So the time is drawing close and we are soon to begin the attic conversion. If you remember, and have read the previous post here and here, you’ll know that we are planning to convert our attic space into a main bedroom and small en-suite shower room. The plans have been drawn up and the builder is in place to start later this month. It’s starting to feel very real now. We’ve emptied the loft and have many of our possessions in a storage facitlity nearby. Much of the loft contents went to the charity shops too so I feel quite cleansed. Now begins the hard work in deciding how the loft will look, and I’m finding it quite overwhelming. I’ve said before I’m not an interior designer and I actually don’t have a lot of experience at designing a room from scratch. One of the main problems I’m having is visualising the space before it’s even been built. Looking at the plans and trying to imagine how big or small the space will be is very tricky, and so choosing pieces to fit the room is practically impossible. One of the first things we’ve been considering is the en-suite. We need to give this some thought in case there are any aspects that need planning into the build such as lighting and pipework. I thought it might be useful to share some of the points we’re having to consider, in case you need to do the same thing. Hopefull this will be helpful to anyone thinking about adding an en-suite or renovating a bathroom. Consider the space you have to use and choose pieces that fit and aren’t too big. You don’t want them taking up all floor space or protruding out into the room too much if the en-suite is smaller. Add some storage to the walls and keep products off the floor as much as possible. This will help the room feel bigger and give an illusion of space. Bearing the above in mind choose a wall hung toilet and basin, possibly with underneath storage. 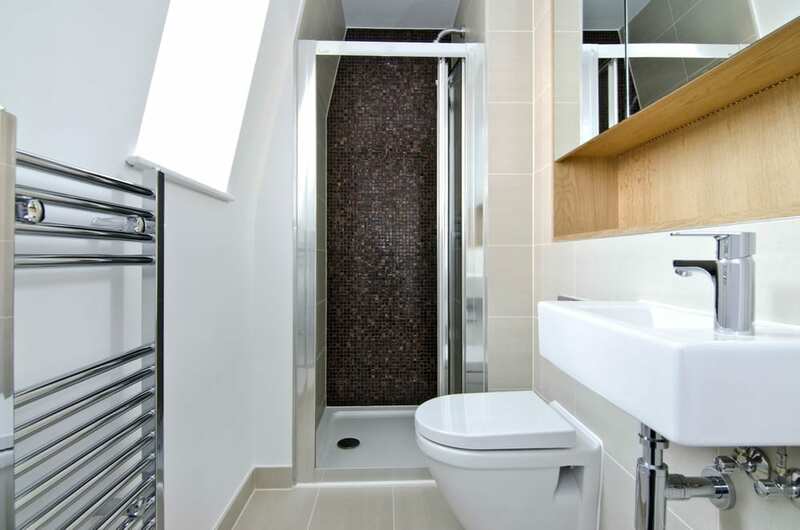 Plan how the pipework and cistern will be hidden if using a back to wall or a wall hung toilet. Make the space feel bigger by using the same tiles across the floor and walls, if you’re using them there at all. Do you want/need underfloor heating? This could save wall space if you don’t need a radiator or towel rail. If you’re adding a shower unit, think about how the door will open into the room. Choose the most space saving design you can. Consider the best type of shower unit for your taste and the room style. Do you want a standalone cabin and steam shower? Will you need an electric shower or a mixer with pump? What works for you and your design? Think about the shower tray and how the waste pipe will sit. If you want something slim and contemporary you’ll need to ensure the waste unit will sit between the boards neatly. I’m sure there are many more points you could add. I seem to only be touching the surface here, but more thought is being given to the project every day. it looks like we will be starting our attic conversions at the same time. We have the 24th of August pencilled in as our starting date. We’ll be clearing the attic before then. The thought of clearing it and having builders in with the mess is fairly scary alright but once it’s done and dusted (pardon the pun) it should be great! We actually looked at a few attics from friends and neighbours that live in similar houses. Good luck with your conversion. I’ll keep an eye on your developments.